Dutch driving talent Bram Chardon has dethroned eight times World Cup Champion Boyd Exell during the exciting Final in Bordeaux this weekend. Bram drove excellent during the two days of the Final and stayed ahead of his fellow competitors. Koos de Ronde took home the silver medal, Belgium’s Glenn Geerts won his first World Cup medal and was happy to win bronze. Before the start of the Final the result of IJsbrand Chardon from Saturday evening was corrected, which put the reigning European Champion in fourth place instead of fifth. The jury had re-started the time for Ijsbrand Chardon in the wrong position after he was stopped. Chardon sr. however knocked two balls down and herewith missed his chance to a podium place. Boyd Exell was unable to make up for his disappointing results from Saturday evening, but he did drive the fastest time in the first round today, which was the fastest clear round this weekend. Boyd finished in sixth place, behind Jérôme Voutaz and ahead of wild card driver Benjamin Aillaud. Bram Chardon was the only driver who stayed clear in all four rounds of the Final: “My team felt very good. The horses were in top form and that was necessary because it was two heavy days with two rounds each. This weekend, everything came together for me. In the past competitions I always had a few minor mistakes and I finished three times in second place behind Boyd. It was a very special Final in which many things happened, but this made the Final extra special,” says Bram. 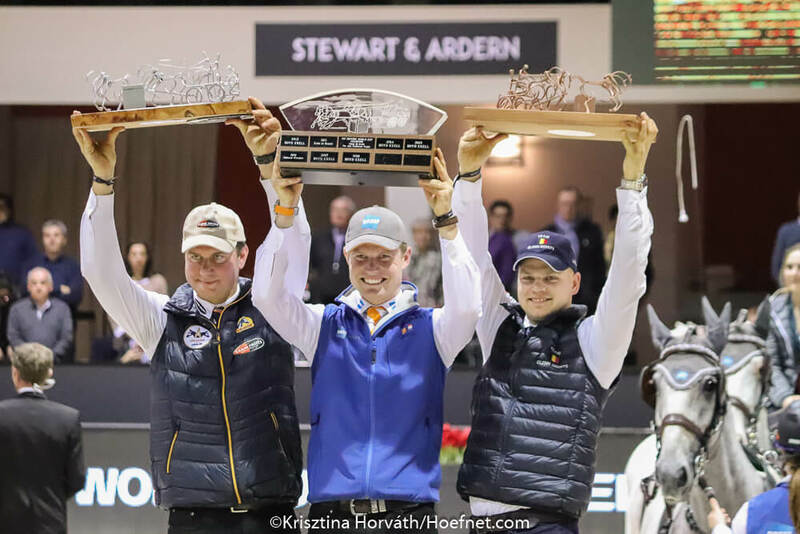 In 2018, the 25-year-old talented driver finished in fourth place in the Fina land in 2016 he was the back stepper of his father IJsbrand when he won the Final in Bordeaux.